A complete turn key system through an Official WPT League Licensed Provider. We provide the Tournament Director and all equipment - Absolutely FREE to your customers - Advertise your venue and your specials on the player console - Increase your nightly revenue on slow nights. Contact us regarding our exciting business opportunities and become a World Poker Tour League venue. Prizes include WPT Main Event Seats, Trips to a WPT final table filming as a VIP guest of WPT; VIP backstage pass, meet and greets with the Royal Flush Girls, the WPT stars and poker pros plus your chance to be on TV. Plus much much more. Become a 'Free to Play' Venue. The game of Texas 'No-Limit' Hold'em Poker and what we do. Playing in poker tournaments, particularly with the showing of no-limit poker on television has become a very popular leisure and social time activity suiting all types of players from beginners to professionals. 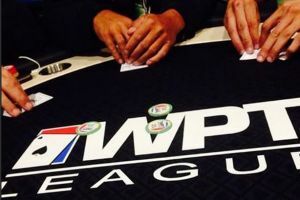 To address this ever increasing social interest, World Poker Tour League has designed exciting fun, free, local no-limit Hold'em poker tournaments and leaderboard advancement structures giving away thousands upon thousands of dollars in prizes. How we increase your business sales and patronage numbers. We hold invitation only venue series and/or championship finals. In order to play in these elite tournaments, players must qualify. To do this they must gain leaderboard points by playing regularly at weekly qualifying events held at participating venues such as yours. The format for a qualifying event is to hold one or two tournament sessions over the course of an afternoon or evening. We also arrange other special event tournaments throughout the year, which will give further benefits to all our participating venues. Why it's profitable for you as a venue. 1. Players will arrive at your venue to register prior to the start of the tournaments, they may order a meal, play the pokies, have a pre-tournament drink etc. 80% of our players will become a loyal repeat customer for your venue. This is due to our player following, which is continuing to expand at an unparalleled rate. 2. Our tournament format allows players to remain in your premises if they are knocked out of the tournament early as they can either play again in a 2nd tournament or could win a random draw to rejoin the tournament at the final table. This is likely to increase their spend at your venue. The player retention rate we have is above 95%. This means our unique poker tournament format ensures over 95% of the players will remain in your venue for over 2 hours. 3. The entire tournament structure will take 3 ½ to 4 hours from start to finish. In addition to this we have a 1-hour registration period, which allows for pre-tournament meals and drinks etc. 4. Because our players will frequent your venue regularly to play in the poker events, they are also inclined to become members of a venues own membership program. This is something WPT League encourages our players to do.